We LOVE these! Finally an answer to the plastic sandwich containers that is a bit more durable than sending your child to school with glass and a plastic lid. Solid stainless steel made in Thailand. Perfectly fits a sandwich. This simple piece enabled me to do away with disposables completely in my daughters lunchbag. 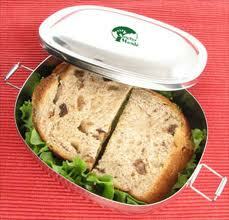 We use them for our own lunches on trips and picnics. An essential piece! 6 1/4 in. X 5 in. X 2 in.